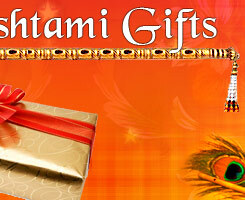 The pious festival of Janmashtami is celebrated with great devotional feel in the sacred town of Vrindavan. The sacred festival of Janmashtami is celebrated to commemorate the birth of the most reverend and dynamic deity of Hindu religion, Lord Krishna. It is believed that Lord Krishna was an incarnation of Lord Vishnu, who is one of the main gods of the trilogy that keeps the world together. It is believed that Lord Vishnu took Krishna's incarnation to end the atrocities of various demons that plagued the earth, especially the demon Kansa. Thus, Janmashtami is a celebration of hope that whenever sin will raise its ugly head, lord will come on earth to end all sorrows. This festival is celebrated with great fervor in Vrindavan, where Krishna spent most of his formative years. The article below sheds some more light on the festivities of Janmashtami in Vrindavan. 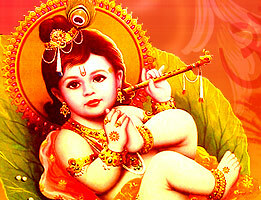 Though Krishna was born in Mathura but Vrindavan is also a significant part of his growing up years. Thus, it is a major pilgrimage site of northern India and is visited by lakhs of Krishna devotees throughout the year. The vibrant and devotionally charged atmosphere of this holy town, especially during the pious festival of Janmashtami, is quite enthralling. It is believed that it is here that Lord Krishna staged rasleelas with his devoted Gopis. The town is bedecked with more than 5000 temples of various Hindu deities. On the occasion of Janmashtami, the entire town is festooned with shimmering flags and temples are decorated with flowers. The entire atmosphere of Vrindavan reverberates with the sound of devotional songs and hymns. The celebrations are not limited to temples but people hold special prayers and feasts at their homes as well to commemorate this day. Unlike other places, in Vrindavan, the festivities of Janmashtami begin at least seven to eight days ahead of the actual festival. Throughout the town, one can see professional artists performing various excerpts from Lord Krishna's life in the form of various musical dramas. The whole town seems to be immersed in the devotional fervor, which is quite unique yet inspiring. Madhuban, the actual place where, according to legends, Lord Krishna danced with his beloved Gopis 5000 years ago still exists here. During Janmashtami, it becomes the main site for Rasleela performances. Some of the most important Krishna shrines of the town which are thronged by devotees during Janmashtami are Banke Bihari Temple, Rangnathji Temple, Shri krishna Balram Temple, Radharaman Temple and ISCKON Temple. The ceremony of Abhishek (holy bath) performed during Janmashtami is the most significant and revered ritual held here. Thus, Janmashtami is a great time for people to remember the spiritual teachings of Lord Krishna.